I don’t have a tracksuit or a pair of trousers to use when I run, so I just pull up my phanek [sarong] to my knees. I run the 3km from my village to the army camp at Leimakhong at least two or three times a day. When I first started running people would look at me in surprise or laugh. So I preferred to run before dawn because there were fewer people on the road. 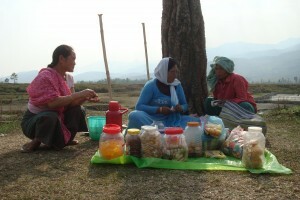 I had spent my whole life in this obscure corner of an equally obscure village in the remote state of Manipur. I never ever thought, even in my dreams, that one day I would be known as a sportswoman. I entered my first race as a bit of a joke. Some of the women I work with wanted to sign up for a local marathon and asked me to sign up too. I was 60-years-old. As most of the women were much younger than me, I took their request as a joke but said, why not, I will also join. So we all signed up. To my surprise I came sixth in the veteran women’s category and won 500 rupees. The money wasn’t that important to me. I bought lunch for the six of us who had joined the marathon with the prize money, and some paan with the leftover amount. What was more significant was the respect that people showed me after the victory. Local women’s and older peoples’ collectives organised reception functions for me. It was the first time that I had been being honoured and recognised by my own people. Before that I was a nobody. 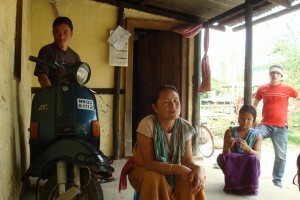 My life was like the majority of Manipuri women. Our roles are wife, mother, grandmother. I was the youngest of four siblings and my formal education only continued until I learnt how to sign my name. I can’t read or write. When I was 17 I married a fellow villager, Salam Ingocha. He taught for a few years at a local school then joined me working at the riverbed quarry. We had four children – a daughter and three sons. My husband used to drink a lot which sometimes ended with him coming home and picking an argument. I went back to my family home many times, but came back again when he came to call me, thinking of the children. There were many nights that I spent hiding outside the house when he was very drunk. I never questioned the way of my life or thought there could be any alternative. I have always been a quarry worker and still am. 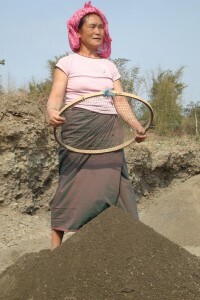 We work along the nearby Leimakhong riverbed, digging for stones and sifting sand. For those of us who live on the riverbanks, the rivers have always been our mother who ensured our survival. Like most others in my village, I was a young girl when I started working there. We use circular sieves to lift the soil from the river and find large stones. Then we sift the soil that is left with finer sieves into smaller stones and sand. Work starts early in the morning. We have a lunch break and a brief rest at home then we continue to work while daylight lasts. A major change came about when a veteran athlete in the next village persuaded me to sign up for trials for the National Masters Athletic Championships to be held in Chennai in Tamil Nadu. I was selected to represent my state in the over-60s category. It’s more than 3,200km from Imphal to Chennai. We travelled by bus to Dimapur in the neighbouring state of Nagaland, and then by connecting trains to Chennai via Guwahati in Assam. I used to see all these inter-state coaches heading for Nagaland or Assam on the national highway near our village. Whenever I would see one I would say I wonder if I will travel on one? And I did. We took one on the first leg of our journey to Chennai. I had never travelled outside the state. I felt a bit strange as I was travelling without even a family member. But our coach was very good and there were many other women in our team, so that strangeness didn’t last long. Soon we were enjoying the train ride, which for many, like me, was a first. In Chennai, there was no distinction between day and night, it was brightness all the time. I also saw the ocean. The water spread on and on, a thousand times bigger than our river. There were people playing in the waves. Some even waded into the water to some distance. I was scared, but I went in briefly just at the edge of the waves. When I first entered the stadium in the Manipur team’s sports pants and top, I almost fainted at the sight of the other participants standing there. I thought, Oh God, they’re so tall, how am I ever going to run with them. I wanted to run out of the event instead, and cursed myself for being so foolish and rash in signing up for sports. But I kept on running. Later, when I heard my name announced as the winner, I wept in elation. I won gold medals in all the events I entered – 800m, 1500m and 5000m. I called my family at 1.30am after winning the first medal. My daughter-in-law, Kunjamani, ran around the village just after dawn to tell everyone. Coming home, I found my elder brothers – Chaoba and Bijoy – waiting for me. I had never seen them crying before. And those same people who used to laugh at me when I was doing my practice runs now stand by and shout in encouragement when they see me running. One major frustration was that I could not speak to anyone from the other states. 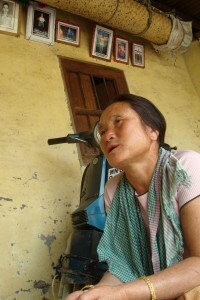 I speak only Meiteilon, the language of the Meitei community in Manipur. The others spoke either Hindi or English. So I have started taking night classes to learn to read and write and my five-year old grandson Abhinash helps me with my lessons at home. I can now count to 100 and write the alphabet in block letters, though I am still having difficulties with small letters. I would like to keep competing but veteran athletes have to pay their travel expenses and are only partly reimbursed after the event. I wanted to go to the Asian Masters Athletic Championships at Kuala Lumpur, but this would cost 70,000 to 80,000 rupees. This is next to impossible for me. So I had to stay back. Recently in the National Masters Athletic Championships held in February this year in Bangalore, I won two silver medals for the 10,000 metres and 1500 metres categories. Sports have given me a new identity. So, I will continue running and try to better myself.